U.S. stocks advanced, while Treasuries held gains after Federal Reserve meeting minutes confirmed the central bank’s dovish tilt on policy this year. The dollar declined. The S&P 500 rebounded from its first loss in nine days as unexpectedly soft inflation reading potentially boosted the Fed’s new wait-and-see approach to rate hikes. The bank’s March minutes showed that a majority of committee members saw risks warranting rates on hold through 2019. Tech shares paced the advance, boosting the Nasdaq indexes. Boeing continued its slide in the wake of the 737 Max fallout, helping to hold down the Dow Jones Industrial Average. The dollar slid against the euro after European Central Bank President Mario Draghi reiterated warnings that global risks continue to batter the region’s economy as the ECB signaled no rate hikes for the rest of 2019. The pound advanced as the European Union leaders met in Brussels to hash out the terms of a Brexit delay. The weaker-than-expected inflation data has heightened the focus on Fed policy, as investors try to figure out what it will take to budge the central bank out of its steady approach. The central bank’s minutes offered few clues. 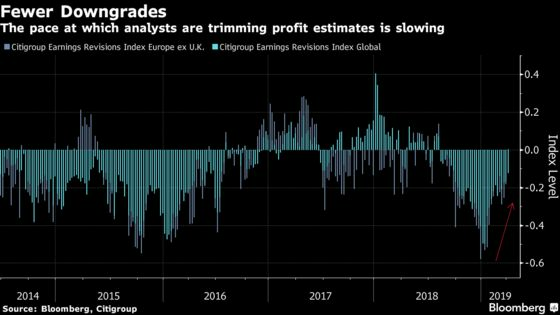 Sentiment remains fragile after the ECB’s and IMF’s somber economic reports Tuesday, and amid an escalation of the U.S.-EU trade dispute while negotiations with China remain unsettled. Elsewhere, Israeli stocks climbed as Benjamin Netanyahu looks set for a fifth term as prime minister after a bruising election campaign. Oil futures gained as speculation that supplies will tighten outweighed Russian caution on more output cuts. Emerging-market stocks advanced for a 10th day, extending their longest run since January 2018. The S&P 500 Index gained 0.4 percent to 2,888.21 as of 4:00 p.m. New York time. The Dow Jones Industrial Average was little changed. The Nasdaq Composite Index rose 0.7 percent, while the Nasdaq 100 added 0.6 percent. The MSCI Emerging Market Index gained 0.3 percent, hitting the highest in almost 10 months. The euro rose 0.1 percent to $1.1273. The British pound increased 0.3 percent to $1.3095. The Japanese yen gained 0.2 percent to 110.95 per dollar. The yield on 10-year Treasuries fell three basis points to 2.47 percent. Germany’s 10-year yield fell two basis points to -0.03 percent. Britain’s 10-year yield dropped less than one basis point to 1.119 percent. West Texas Intermediate crude increased 0.8 percent to $64.46 a barrel. Gold rose 0.3 percent $1,312.30 an ounce. The Bloomberg Commodity Index gained 0.5 percent.